On today’s episode of Strongly Connected Components Samuel Hansen speaks to Sylvia Bozeman and Rhonda Huges, the co-founders, and Ulrica Wilson and Ami Radunskaya, the current directors, of the EDGE Program. 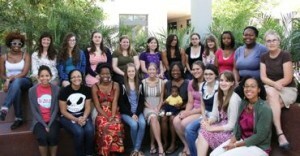 EDGE is a program all about creating the next generation of women leaders in mathematics. They speak about how EDGE was started, where it has been, where it is right now, and where it will be going in the future. Samuel also asks them for one idea to make mathematics a more inclusive subject today.